Spot On cool gel – Muscle pain reliever. Muscle pain refers to the pain and inflammation in the body’s soft tissue. It develops due to the excessive strain on a particular muscle, tendon or joint. This pain causes discomfort and requires immediate relief. Spot On cool gel, a muscle pain reliever helps in relaxation and provides a cooling effect on the muscle. 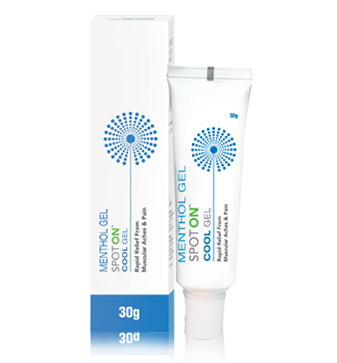 Spot On cool gel consists of an active ingredient, menthol. This gel generates heat on the affected area and provides a cooling effect helping the muscles to relax and thus reduces pain. Apply the cream generously and gently massage it on the affected area until completely absorbed. Repeat it 2 to 3 times daily.